The inaugural Medina Ride of Silence was held Wednesday, May 20th. Starting at the Century Cycles shop, sixteen riders rode at a slow pace in near-silence to commemorate bicyclists who have been killed or injured on America's public roadways. The ride was completed safely, but since the ride was close to the city of Medina, there were plenty of motorists who showed their lack of knowledge of the rules of the road. Hopefully through events like this, cyclists can raise awareness of this critical issue. 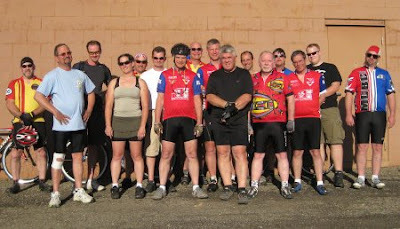 Thanks to the Medina County Bicycle Club for their help in getting the event organized. You can find more information about the world-wide Ride of Silence campaign at www.rideofsilence.org.